Thomas Panek, President and CEO of Guiding Eyes for the Blind, used dogs from the organization he manages to run in and complete a half-marathon in the New York City Marathon. Because of the length of the run, three dogs did a relay each taking a leg of the race to help Panek run and finish. Waffle, Westley and Gus, all Labradors, accompanied Panek and each got a medal for completing in addition to Panek. In an NPR interview, Panek explains that for a time he stopped running due to the dangers. "There was a long time where I was too scared to run. I was just afraid to get out there. And I had run in the Chicago Marathon. And about midcourse, I ran into a stake that was in the ground, didn't see it." He tried running with people to assist, but he missed the freedom of running alone when he wants to, like when he walks with a guide dog and can go anywhere at his whim. 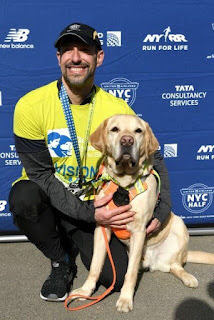 I love the connection of humans and dogs, I can't imagine my life without one (or more) and am always inspired by the service that dogs can provide to us.This is another great story on how dogs can help people conquer things they can't do on their own.